ZATTA -Li Governi del Berri, del Nivernois, della Marche, del Bourbonnois e dell 'Auvergne Di Nvoua Projezione. ZATTA, A. - Li Governi del Berri, del Nivernois, della Marche, del Bourbonnois e dell 'Auvergne Di Nvoua Projezione. Li Governi del Berri, del Nivernois, della Marche, del Bourbonnois e dell 'Auvergne Di Nvoua Projezione. - ZATTA, A. Title : Li Governi del Berri, del Nivernois, della Marche, del Bourbonnois e dell 'Auvergne Di Nvoua Projezione.. Size : 18.7 x 15.2 inches. / 47.6 x 38.7 cm. 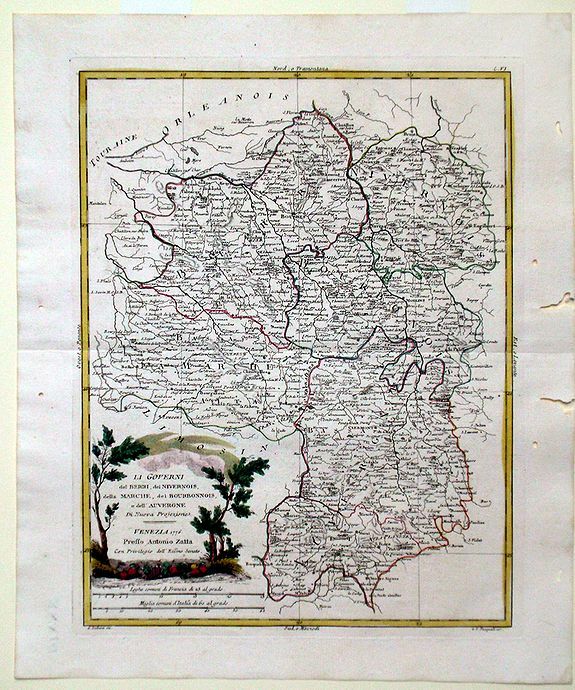 Description :Map of five regions in central France including the province Berry, most famous for the 14-15th century illuminated manuscript, "Les Trés Riches Heures du Dec de Berry"; the region Nièver, the medieval county of Marche, the historic province Bourbonnais and Auvergene to the south. Each region is divided with colored ribbons and the map is surrounded with a vibrant yellow border. The colorful cartouche in the lower left corner is illustrated with trees, fruit and wheat. Condition : Six holes and two town spaces no more than an inch long around the margins. Faint staining in the right corners and margin.